So excited...have you heard? 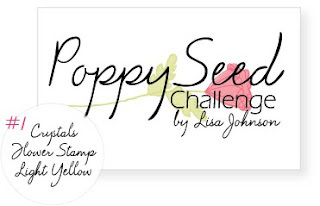 Lisa Johnson started "Poppy Seed Challenge" - I think it's a great concept, and I'm looking forward to take part in it regularly. 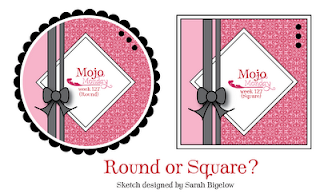 My head is a little bit cloudy today - I've been battling a major cold ALL week, so I decided to combine two challenges together to save some time and energy (which this cold has totally drained me of), Lisa's and this week's Mojo Monday sketch. I stamped the green panel in Tsukineko London Fog, using two different stamps from Papertrey Ink's "Life" set. For the middle diamond, I used another stamp from "Life", and stamped the flowers using Tsukineko Sage. 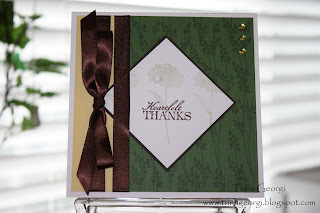 Using a sentiment stamp from Verve, I stamped over the flowers in Tsukineko Jumbo Java. Added three rhinestones, and done....whew! I think I now deserve a nice hot bowl of chicken noodle soup. That is a really elegant card. Those colors are great together, and I like how you stamped the background. Love your color combination! Great job. Mojo Monday 126 - Be the Star that you are!